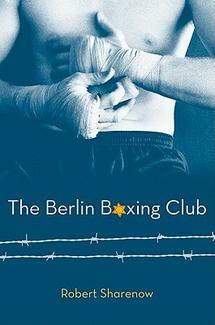 The Whole Megillah interviews The Berlin Boxing Club‘s author, Robert Sharenow, and his editor, HarperCollins editor Kristin Daly Rens. The Whole Megillah (TWM): What attracted you to this place and time? Rob Sharenow (RS): I’m drawn to time periods and circumstances that inherently have extremely high stakes for the people involved. It’s hard enough being a teenager and navigating your way through school, your family, your social life. But then throw the Nazi government on top of that, and you have a tremendous amount of dramatic potential. 1930s Berlin was a explosive environment in so many ways, art, music, the government, sports was all being effected by the changing political tides. TWM: What prompted you to include Karl’s illustrations and his fondness for comics? RS: Growing up, I aspired to be a cartoonist, so that aspect of the book was very much drawn from my personal experience. The 1930s was also the time of the birth of the comic book superhero and the golden age of newspaper comic strips, so I wanted to interweave that as part of the story. Nearly all of the great superheroes, including both Superman and Batman, were created by young Jewish men during that era. And I thought of Karl having a kinship with them, or perhaps even becoming one of them. TWM: How did you decide to include the Countess character and the characters in the gym? What was the inspiration? RS: The Countess has really emerged as many readers’ favorite character, which I find interesting. I wanted to demonstrate how the Nazis targeted anyone who was different, not just Jews. The other boxers in the gym were a great opportunity to create an alternative universe for Karl, a place where he could learn to be a man on different terms, where you would be judged on your skill and courage, not on your race or religion. TWM: Your characters are so beautifully nuanced. What drove you to make Karl’s father a war hero and make him and Hildy appear physically different from Karl and his mother? What inspired you to develop Karl’s mother the way you did? RS: I was drawn to tell this story because of the amazing confluence of large historical events that influenced my protagonist, Karl. But I never wanted the reader to lose sight of the fact that I was telling a real human story about a real family. So I tried to create believable characters who each had depth and complexities of their own. One of the interesting facts of life is discovering your parents’ secrets and getting to know them as human beings and not just parents. I wanted Karl to be struggling with both extraordinary things like the oppression of the Nazis and normal things like his strained relationship with his father and his evolving relationship with his sister, Hildy. In terms of the specific choice of making his father a war hero, that was based in reality. Many German Jews served in the army during WWI and considered themselves patriots. So it was particularly bitter when the government turned on them. As to Hildy’s physical difference, that was in part based on my own relationship with my sister, only the coloring is reversed. My sister has blond hair and blue eyes, while I have brown and brown. TWM: Please describe your research process for this story. RS: The research took years. I read dozens of books on Berlin, boxing, cartooning, and the Holocaust. I watched hours of videos of old fights. I even took boxing lessons, although I never actually got into the ring against a real opponent (my wife would’ve killed me). TWM: What was your greatest challenge with this book? Your greatest satisfaction? RS: The greatest challenge is writing about a time period convincingly and getting the details of everyday life correct. It’s easy to research big historical moments. It’s much more challenging to figure out facts of everyday life in the 1930s. Did most people have telephones? How much did a dozen eggs cost? Did everyone have indoor plumbing? Did boys and girls go to school together or separately? What did kids do for fun back then? My greatest satisfaction is hearing that readers have responded to the journey of the characters, that in some way, it resonates as real and meaningful in today’s world. TWM: Thanks, Rob. Kristin, let’s turn to you. Many agents and editors talk about the difficulty in successfully placing historical fiction. What is your perspective on that? Kristin Daly Rens (KDR): Technically, it’s true that historical fiction isn’t necessarily considered a commercial genre in the way that, say, paranormal and dystopian are considered commercial. Most historical fiction stories tend to be a bit quieter, in that they may not have the marketing hooks that make those other genres stand out. But that doesn’t mean that editors or agents don’t want to publish these books—quite the contrary, since so many of us grew up loving historical fiction (and still love it today). It just means that it’s more important to find and publish the most exceptional stories in that genre, because those, like The Berlin Boxing Club, are the ones that will not only stand out and find an enthusiastic audience, but also hopefully keep finding readers for years to come. TWM: Similarly, many agents and editors say, “No more Holocaust stories.” What made this one stand out? KDR: To be fair, I suspect that agents and editors say that about a lot of subjects! But I think those same editors and agents—myself included—change their tune if they’re presented with an amazing manuscript. In this particular case, Rob was writing about this place and time from a point of view that I hadn’t really seen written about before: that of a boy whose background is Jewish, but because his parents haven’t raised him in the Jewish faith, he doesn’t really consider himself a Jew. In fact, at the beginning of the story he identifies more with boys in the Hitler Youth than he does with his Jewish classmates. And his struggle to understand why he’s being bullied for a faith that he doesn’t really embrace as his own is both compelling and heartrending. TWM: What attracted you to this story? KDR: In the interest of full disclosure, I actually wasn’t the editor who acquired The Berlin Boxing Club—that was Laura Geringer, from whom I took over the project after she left Harper—though the manuscript was acquired on proposal, so I have been working with Rob from his first full draft of Berlin. And of course I like to think that if the proposal had come to me on submission, I would have snapped it up immediately! All of that said, there are so many things that attracted me to Berlin Boxing Club the first time I read the manuscript: Rob’s writing, which is gorgeous and evocative; the way he beautifully marries the political and social upheaval happening in Berlin at the time with the life-altering events that take place in Karl’s family; the character relationships, which are wonderfully complex; and Karl’s quest to find himself, and his own unique talents, through boxing and art—a quest to which any teen can relate. TWM: What was your greatest challenge with this book? KDR: I think—and I suspect Rob would agree—that the two aspects of the story that were especially challenging were bringing Karl’s voice to life, and doing justice to the Berlin setting. When Rob first conceived of Berlin, Karl was telling the story as an older man looking back over his life, which created not only a distance between the narrative voice and the events of the story (as Karl was telling his story with an emotional distance of fifty years or so) but also between Karl and the reader. And so to make the story more relatable for the teen readership, we decided that Karl should be telling his story in a more immediate way, as if the events were happening at the same time Karl was telling us about them (or shortly before). And Rob really knocked it out of the park on the very first revision—in giving the narrative voice more immediacy, he also gave the story more dramatic and emotional heft. The second challenge was really making sure that the setting of mid-1930s Berlin was brought vividly to life. We felt strongly that Berlin had to be almost another character in the story, right along with Karl, Max, and the others, which I think Rob accomplished brilliantly—I’m in awe of the amount of research he did for this book (not only via books about Nazi Germany, boxing, and the history of comic books, but also old videos of Max Schmeling’s boxing matches, etc)! TWM: What have the results been? This entry was posted in Authors, Editors, Two-in-One and tagged 2012 Sydney Taylor Book Awards, Kristin Daly Rens, Robert Sharenow, The Berlin Boxing Club. Bookmark the permalink. Wonderful interviews, Barbara. Thanks for posting this. I will be reading this book very, very soon. It sounds fascinating. Thanks, Rosi! You’ll love the book. Thanks for the post. I look forward to reading this book!